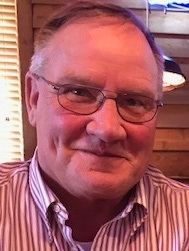 Wadesboro - Mr. Dennis Lee “Pete” Cook, age 67, passed away suddenly at his home on Monday, April 8, 2019. A service to celebrate Pete’s life will be held at 4:00PM on Thursday, April 11th at Mt. Beulah Baptist Church with Rev. Randy Storz officiating. Masonic funeral rites will immediately follow at Anson Memorial Park. The family will begin greeting friends in the church at 3:00PM. A native of Anson county, Pete was born September 25, 1951, to the late Elease Bolton Cook and Claude Lee Cook. He was the baby of the family and the only boy with eight older sisters, but always insisted he did the best he could, given that handicap! As a teenager, Pete started work by sweeping floors at Wade Mill. He went on to work for Wansona, Pee Dee Orchards, Southern Fabricators, and finally Valley Proteins where he retired. Pete was a longtime and active member of Mt. Beulah Baptist Church where he had served many years as a deacon. In his younger days, he taught the Royal Ambassadors of the church along with a youth Sunday school class. Pete also had a passion for fraternal Freemasonry. He was a faithful member of Kilwinning Lodge #64 as well as a 32° mason, having traveled through both the York and Scottish Rites. He served in many offices and capacities over the years including the Grand Commandery Knights Templar of North Carolina. Survivors include his wife of 45 years, Joyce Odom Cook of the home; a daughter, Amanda Plyler (Robbie) of Monroe; a grandchild and the apple of his eye, Addison “Addie” Plyler; plus two bonus grandchildren, Anna Plyler Melson and R. J. Plyler. Also surviving are three sisters, Bobbie Stephens of Wadesboro, Christine Thompson of Mt. Gilead, and Doris Marsh of Ludowici, GA; a number of nieces and nephews; and many Masonic and York Rite brethren across the state of North Carolina. The family suggests that memorials be made to Mt. Beulah Baptist Church, 3373 Country Club Rd., Wadesboro, NC 28170; or to the Masonic Home for Children, 600 College Street, Oxford, NC 27565. This Page is offered to all who need a moment of peacefulness. In Memoriams to Grand Encampment Members will be posted here. Information-Select Purpose/Activities FAQ/Information Join/Information Policies/Contact Educational Fdn.